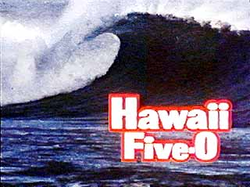 It was fifty years ago today- September 26, 1968 and the television procedural police drama Hawaii FIve-0 premiered on CBS television. The Show which was shot on location starred Jack Lord as Detective Captain Steve McGarrett and James MacArthur was Detective Sergeant Danny Williams. The show would be a popular one- lasting until 1980- 12 seasons and 279 episodes. Hawaii Five-0 would be the longest running crime show on American television until 2003 when Law & Order passed it. A large part of the popularity of the show had to do with the show being shot in Hawaii. At this point Hawaii had only been a state for nine years and a lot of Americans were not all that familiar with Hawaii or the Pacific. The show looked great. I can’t say that I was a fan I watched it at times but when it premiered I was only seven. It really didn’t appeal to me at the time.